Heat oven to 350ºF (325ºF for dark or non-stick pan). Grease bottom only of 8- or 9-inch square pan with shortening or cooking spray. In medium bowl, stir brownie mix, beer, oil and egg until well blended. Spread batter in pan. Bake 8-inch pan 35 to 38 minutes, 9-inch pan 30 to 33 minutes, or until toothpick inserted 2 inches from side of pan comes out almost clean. Cool completely in pan on cooling rack, about 1 hour 30 minutes. 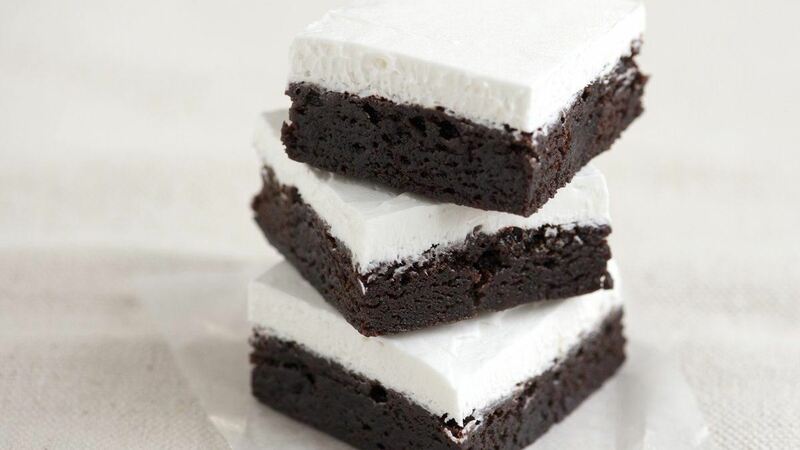 Spread frosting evenly over brownies. Refrigerate about 30 minutes or until firm. Cut into 4 rows by 4 rows. Variation: Replace the beer with cold brewed coffee for mocha brownies. Success: When cutting the brownies, use a sharp chef's knife and clean the blade after each cut.